The third clasico of the season, but the first meeting in the league, ended all square at the Camp Nou, Messi 2 Ronaldo 2. Or at least that is what many in the media would have you believe. And while these two players are the clear stand out performers for both teams, there is much more than their individual performances to discuss. The game lacked the same level of aggression and intensity that has been so prevalent in recent encounters between the two. There were also a couple of developments which broke from the norm. Barcelona committed more fouls than their counterparts (17vs16) and Madrid scored two goals from superbly constructed moves in comparison to Barcelona’s goals arriving via a defensive error and a sublime free kick. Both managers made changes to their starting line ups following their away victories midweek in the Champions League. Vilanova, somewhat surprisingly, chose to replace the injured Puyol with Adriano. Further forward, Iniesta returned following injury with Sanchez dropping to the bench. Despite the inclusion of three full backs in Alba, Adriano and Alves with only one centre back in Mascherano, Barcelona lined up with a back four. Adriano operating as a left sided makeshift centre back. Mourinho brought back Di Maria, Khedira and Ozil into the starting eleven with Essien, Callejon and Kaka all sitting on the bench. Madrid began with their now familiar 4-2-3-1 formation. The inclusion of Iniesta at the expense of Sanchez provided Barcelona with increased depth and strength in the midfield area but removed their attacking threat on the wide left area. Iniesta tucked inside closer to central midfield. Vilanova would have assumed that Iniesta could afford to do so rather than hold a left sided position as Arbeloa is not the most threatening of full backs. Arbeloa followed Iniesta inside opening up the left flank. This would then allow Alba to move freely on the left as Di Maria naturally drifts inward also. However, Khedira made a number of runs forward, pulling to the right and looking to expose the space behind Alba. It’s been a common theme in clasico’s whereby Madrid seek to expose Barcelona on the counter and in behind the full backs. For Madrid, the team operated more or less as anticipated when the line up was announced. Ozil was able to drift laterally on either side behind Benzema whilst Ronaldo operated in the inside left channel looking to either cut inward or occasionally go on the outside of the full back. Marcelo sought to attack when possible, causing Dani Alves some problems early on with his attacking impetus. The game, after the first 30 or so minutes settled down into the pattern which we have witnessed recently. Barcelona dominate possession whilst Real Madrid seek to counter attack. 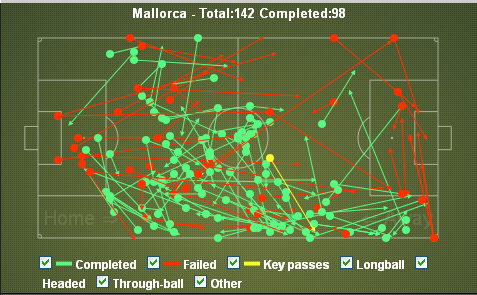 Barcelona made 637 successful passes from an attempted 724, a pass completion rate of 88%. With a more direct style, Madrid completed 237 passes from 322 attempted, a completion rate of 74%. The game threatened but never reached the heights of recent clashes in a collective sense but individually, Messi and Ronaldo demonstrated their standing as the best players in the world. Real Madrid settled much quicker than their hosts creating a number of opportunities which are examined later, including the opening goal from Ronaldo. Barcelona failed to find any rhythm as Madrid pressed intelligently. When attacking, Barcelona moved centrally too often leading to the play being congested. Real kept the space between their lines to a minimum and defended narrowly. 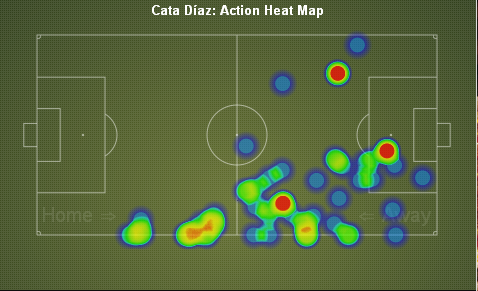 With Iniesta tucking in from the left and Arbeloa following, the central area was often packed. Madrid were defending well, preventing any space from developing. The only real outlet for Barcelona was via Pedro who offered genuine width on the right. The equalising goal arrived from a Pedro cross. With Madrid holding two narrow banks, Pedro had time and space to receive a pass and cross the ball before Marcelo closed him down. Pepe badly misjudged the bounce of the ball and Messi was able to score. Real Madrid continued to sit deep and allow Barcelona to attack, operating with Ronaldo and Ozil normally left up front on their own. Both sides still appeared tentative. Khedira broke forward on the right again and support was available but the move fell away. On two separate occasions, Alba and Pedro provided crosses but no Barcelona players were in the penalty area to take advantage. Barcelona took the lead from a near perfect free kick from Messi. Again,Messi received the ball centrally but was subsequently fouled by Alonso. The execution of the free kick was superb. Prior to the goal, Barcelona were about to make a substitute, withdrawing Cesc for Sanchez. An attacking move, the substitution still went ahead despite Barcelona now leading. With Madrid trailing, the game would become stretched providing space for Sanchez to break into and to create by holding a wide left position. There was little opportunity for Sanchez to have any impact before Madrid equalised. Madrid pressed effectively in midfield and the ball broke to Ozil who hit a wonderful pass through the Barcelona defence for Ronaldo to collect and sweep home. No real clear cut chances emerged after this. Were both teams too conservative in the game? Barcelona have had defensive difficulties thus far this season and have yet to field the same defensive line up in two successive games. This is compounded by the present injury situation which required Adriano to deputise as a makeshift centre back. Vilanova seemingly deciding that neither Song or Bartra were suitable replacements. The inclusion of both Iniesta and Cesc ahead of Sanchez meant there was no real width on the left handside unless Alba moved forward. A key aspect of Messi moving deeper to perform a No10 role has been the need for inward runs from the wingers to a No9 position providing an attacking threat and occupying the opposition defenders. Without this, the opposition can push high and squeeze Barcelona. If the wingers don’t provide diagonal runs, the midfielders, principally Cesc, must break forward. This was not adequately addressed as midfielders breaking forward seldom occurred and there were no options on the left and Pedro remained wide right. Vilanova sacrificed attacking width for midfield security. Too often, there was nobody willing to run beyond the ball or Barcelona . 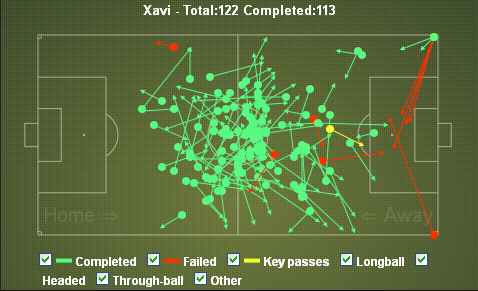 Xavi, whilst excellent with his distribution, had few options for the killer pass and operated slightly deeper than normal. An indication of Barcelona’s desire to protect the defence. From the Madrid perspective, why did Mourinho not force the issue more? Real Madrid created a number of early chances and should have led by at least two goals by the time that Messi struck. The goal seemed to energise Barcelona whilst Madrid retreated into a more defensive frame of mind. Should Madrid not have pressed Barcelona more, taking advantage of the uncertainty within their defence? Did the conservative line up from Barcelona have a knock effect on Real Madrid? The normal space which Real Madrid can exploit against Barcelona was not available. Barcelona sought and gained midfield security for the remainder of the team, committing fewer players in attack.The extent to which Madrid dropped off Barcelona can be seen by the graphic below which shows all of Real Madrid’s tackles in the game. All were attempted within their own half of the pitch. The defence moved deep but held a solid line, close to the midfield preventing Barcelona from having the space in which passing movements could be constructed. Madrid were seldom forced into last ditch clearances or tackles around their penalty area. 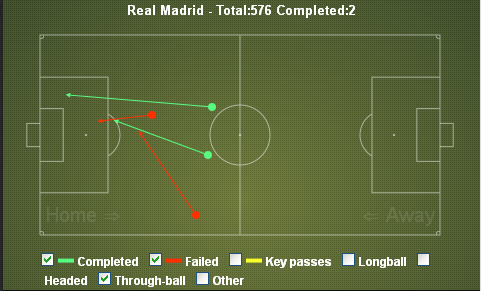 Real created a number of clear cut chances in the early stages of the game. Whilst there were some elements of poor defensive play involved, Madrid crafted a number of openings through their intelligent play and movement of the players. Benzema had an early chance in the 12th minute when a Ronaldo cross from the right arrived at the far post where the French internationalist arrived unmarked, but hit his shot wide. Dani Alves had been attracted towards the run of Marcelo. Sergio Ramos should have scored in the 20th minute when he was allowed a free header at a corner kick. Interestingly, Barcelona were using a combination of man marking and zonal marking perhaps to compensate for their lack of height and the threat which Madrid carry at such set pieces. Ronaldo’s first goal arrived following a well worked move from Madrid. The move was instigated by a diagonal from Xabi Alonso to Khedira high on the right wing. The ball was eventually recycled to Ronaldo who broke inward on the left. Alves, similar to his positioning against Sevilla when Trochowski scored, failed to close Ronaldo down and provide an attempted block. The graphic above illustrates the gap which Ronaldo exploited with Barcelona attracted to the ball. Ronaldo’s drilled shot beating Valdes at his near post. Immediately following their goal, Madrid pressed Barcelona very aggressively sensing that the Blaugrana were struggling for composure and solidity at the back. Benzema hit the post in the 24th minute. Di Maria ran forward into the penalty area before passing to Benzema. No Barcelona player matched the run of Di Maria. That Madrid failed to add to their opening goal would have been the only real issue for Mournho during those opening 30minutes. Madrid were organised and efficient with an incisive edge going forward. Who will be the happier manager following the game? This was surely the time for Mourinho and Madrid to press Barcelona and take advantage of their poor defensive set up and patched up defence yet it never quite materialised following the initial good start to the game. Madrid remain 8 points behind Barcelona but perhaps crucially, they now, in theory, have the edge in the head to head record based upon the assumption that they win at the Santiago Bernabeu. For Vilanova, the record breaking seven opening game winning streak was missed but he must be pleased with how the team performed given the line up. Defensive anxieties returned once more and whilst Barcelona have been fortunate in games this season, the defensive situation needs addressed at the earliest opportunity. At this early stage of the season, perhaps both managers were content with a point. Titles are not won or lost in October. Real Madrid arrived at the Sanchez Pizjuan in the unusual position of being below Sevilla in La Liga. They remained below their hosts as they departed too with a 1-0 defeat condemning the Madrid side to their worst league start in over a decade. On their two previous visits, the title holders had emphatically defeated their host’s with comprehensive 6-2 victories yet the Andalusian team displayed an intensity and workrate for the whole game which Madrid failed to match and as a result were unable to impose themselves. Michel made one change from the side which drew 0-0 away to Rayo Vallecano prior to the international break. Manu was removed from the team to be replaced by Maduro, a clear indication of the need for increased defensive stability from Sevilla. Mourinho started with the anticipated side. Marcelo continues at left back in place of the suspended Coentrao. Modric started on the bench once more. The Madrid shape was their customary 4-2-3-1 with Higuain once more preferred to Benzema as the lone striker. From the opening minutes of this game, it was apparent how Sevilla were going to play. Their approach was going to be fast, direct and in the face of their opponents. The passing statistics bear witness to this approach. Sevilla made 241 successful passes from an attempted 361 passes. With pass accuracy of just 66% and overall possession of just 42%. Sevilla did not require possession to hurt Madrid. They retained shape, competed and sought Negredo and the increasingly important Navas for penetration at the earliest opportunity. Sevilla set up in a 4-2-3-1 with some important points to note. 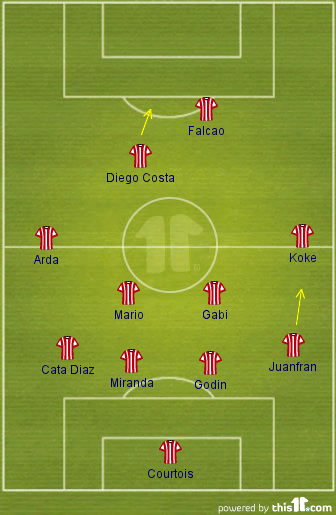 The “2” stayed very central and close to the centre backs, Maduro playing deeper than Medel. Upfield, Rakitic was deployed centrally with Trochowski very narrow on the left and supporting his colleague in the centre. This contrasted sharply with Jesus Navas on the right who provided width and pace with the intention of supporting Negredo in the striking role. The full backs adopted similar roles. Cicinho looked to get forward and support Navas whereas Navarro stayed deep, aware that he had no direct cover in front of him. The early part of the game was punctured with fouls, there was 14 in the opening 30 minutes. This stop start nature suited Sevilla as it prevented Madrid from finding any semblance of fluency in their play and it continued for much of the game although the number of fouls committed tailed off. The fouls were also being committed high up the pitch, away from the Sevilla penalty area. The rojiblancos were holding a relatively high line and squeezing the play in the centre of the pitch, suffocating their opponents. Ronaldo only had two opportunities to shoot at goal from a free kick during the game. In the opening 25minutes of the match, Ronaldo, Higuain and Ozil were all fouled in aerial challenges around the halfway line. Sevilla had laid down a marker. Sevilla collected three cautions, two of which were for fouls committed in their opponents half of the pitch. The third yellow card arose from the confrontation between Navarro and Higuain. The only goal of the game was scored in the 1st minute. Sevilla had begun the game at a very high tempo and Casillas had already been called into action before the home side gained the first corner of the match. With some atrocious defending, the ball was allowed to drop in the centre of the penalty area around 8 yards out where the oncoming Trochowski met it on the half volley. Higuain was supposed to be marking Trochowski but allowed his opponent to run off him. Madrid allowed themselves to get drawn into a scrap with Sevilla instead of focussing upon building the play. Despite having 58% possession, Madrid only made 466 successful passes from an attempted 576. With just 80% pass accuracy, los blancos were not passing the ball enough and too often passing was sloppy and misplaced. Everything was rushed and increasingly they went long and to the wings, unable to pick their way through the centre of the pitch. Madrid made 38 successful long passes but a further 28 attempted long passes were unsuccessful. Madrid seemed to be troubled by the intensity of the Sevilla play and the starting line up could be questioned. With the oft quoted “FIFA Virus” brought into vogue following the international break, should Mourinho have rotated the team? Di Maria and Ozil looked well off the pace. Of course, when it comes to rotation, Mourinho is damned if he does and damned if he doesn’t. Rotate the team and suffer defeat and he would have been lambasted for not selecting his strongest team. The Sevilla midfield pairing of Trochoski, but principally Rakitic, worked extremely hard to close Xabi Alonso down and prevent him from constructing play from Madrid. Teams in the past have demonstrated that Madrid are much less of an attacking threat if you can reduce the effectiveness of Alonso. It’s the Basque playmaker who knits the play together for Madrid. Without him, the team can sometimes appear broken, split into a defensive and an offensive unit. Alonso binds them together. It’s the main reason that firstly Sahin and now Modric was acquired. To provide an alternative to Alonso whom Madrid rely heavily upon and reduce his burden. Alonso was operating deep and made only 72 passes during the game. With the central area of the pitch clogged by Sevilla, Alonso was forced to go wide with his passing. HIs lack of mobility is also an issue and whilst his defensive performance was still sound, he could not instigate sufficient levels of creative play for Madrid. Mourinho made two substitutions at half time with the removal of the ineffective Di Maria and Ozil, replaced by Benzema and Modric. The introduction of Modric saw Madrid revert to a 4-3-3 with a midfield trio of Alonso, Khedira and Modric. This should have provided Madrid with the strength and craft to meet and surpass the challenge from Sevilla. 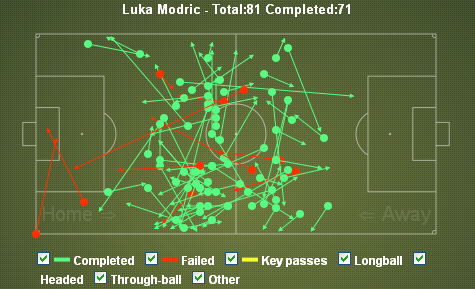 For a brief spell after half time, Modric was making passes and linking play well but it soon fell away. 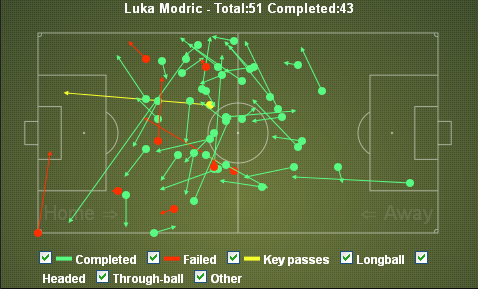 Similar to Alonso above, too much of Modric’s work was in relatively deep areas and not in an advanced area of the pitch. When Rakitic was replaced with Manu, the space Modric was enjoying as his fellow Croatian tired, was removed. Michel made three substitutions in the second half, all of which were reactionary to those made by his opposite number. Michel’s first substitution saw Manu come on for the tiring, and already cautioned, Rakitic to fulfil the same role – pack the centre of the pitch and disrupt Madrid. Mourinho made his final substitution in the 65th minute when Arbeloa was withdrawn and Callejon entered. This switch required Khedira to become an auxiliary right back and Callejon playing on the right wing. Mourinho would have been comfortable with such a move given that Trochowski had operated so centrally during the game and Sevilla had offered little attacking threat from the left. Michel made yet another reactive substitution to counter this just 4 minutes later. Negredo was replaced by the left sided defender Luna. Manu now occupied the striking berth with Trochowski in the centre and Luna moved across to the left to provide support for Navarro against Callejon. Sevilla’s final change was the replacement of Trochowski with Kondogbia in the 81st minute as Michel took the “what we have, we hold” approach, strengthening the centre of the pitch in anticipation of one last push from Madrid which never quite materialised. Following the game, Jose Mourinho was scathing in his post match criticism of the side. With an important Champions League game against Man City in midweek, Madrid need to bounce back quickly to prevent the poor form descending into a crisis. A well deserved victory for Sevilla as they stop a run of seven consecutive defeats to Madrid in all competitions and secure their first league victory since a 2-1 success in October 2009. They retain their undefeated record in the league but the commitment and workrate shown by his players will arguably be the most pleasing aspect for Michel. There are signs that Sevilla are once more moving in the correct direction after a few disappointing seasons. For Madrid, a 17 league game unbeaten run away from home has ended with successive away defeats. There is not time for the players to sulk as they have an important Champions League tie against Manchester City awaiting. It’s difficult to envisage Madrid playing so poorly once more but there does appear to be a certain lethargy about the squad. Should this persist, it may raise questions about the pre-season tour in the USA. Real Madrid adopted a very deep and defensive approach for the first half and began the second half in a similar fashion. Madrid were content to drop off Barcelona and only press when Barcelona crossed the halfway line. In many respects it was a typical first half Barcelona performance as they dominated possession (70%) but ultimately lacked penetration. Madrid offered a threat on the counter attack but this waned as the first half progressed. It was noticeable that in the opening minutes, neither Barcelona full back pushed forward yet once the Madrid shape was recognised, Alves and then Adriano began to move forward and provide overlaps for Sanchez and Pedro respectively. Mourinho has entered games against Barcelona with a range of tactical strategies to deliver the desired results with just two victories in eleven meetings to date. Recently, when Madrid have attacked Barcelona and pressed them aggressively, Madrid has enjoyed a greater share of possession and favourable results. Last night, this was abandoned in favour of a defensive minded strategy. Which inevitably begs the question of why did Mourinho choose such a defensive set-up last night? Firstly, given it was a two legged tie, Mourinho would have wanted to keep things as tight as possible early on. In the first leg of the Champions League semi final in April 2011, Real Madrid were very defensive, only conceding to Barcelona late on following the dismissal of Pepe. Afterwards, Mourinho claimed the strategy was to attack Barcelona in the last thirty minutes of the game with attacking substitutes. A ploy which was denied when Madrid had been reduced to 10 men. It seems reasonable to suggest that Madrid trying to replicate this last night. 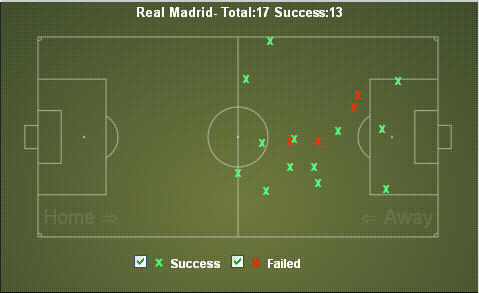 Despite being level at 1-1, Madrid were more aggressive after the hour mark. With the scores level and the away goal secured, Madrid were operating from a position of strength yet the game became increasingly stretched which provided Barcelona with more space to attack and seek openings. Benzema and the anonymous Callejon were replaced by Higuain and Di Maria in the 60th and 65th minute as Madrid injected fresh impetus into their attack as they began to tire. With the tie delicately poised, it will be fascinating to see how Mourinho approaches the second leg. A fine start to the season for Pedro has seen the Canary Islander score two goals in the opening two games suggesting a return to form and fitness. Last season was something of a disappointment for Pedro both collectively and individually. The season was disrupted through injury and a loss of form. Despite making 48 appearances, Pedro started in only 32 of them and was often substituted himself. As the season drew to a conclusion, Pedro offered glimpses that he was rediscovering form particularly in the Copa del Rey final against Athletic Bilbao. Now, fully fit and on form, Pedro offers Barcelona a significant goal threat from the wide area reducing the reliance upon Messi. His goal last night encapsulated the best of his qualities, playing off the shoulder of the deepest defender and accelerating away to collect a through pass before slotting the ball home. Yet to only consider the attacking qualities that Pedro brings to the side would be a considerable injustice. Although not the greatest technician within the Barcelona side, Pedro understands the role that he is expected to perform perfectly. He combines his attacking role by undertaking the defensive aspects diligently. His pace is essential in closing down defenders and pressing high up the pitch providing the first line of defence. The outcome of the entire tie could hinge upon the events of the 84th minute last night. Casillas saved from Messi and Pique, on yet another foray forward, was unable to make contact and force home the 4th goal for Barcelona . Madrid , who were dangerous throughout on the transition, launched a counter attack which petered out when the ball was played back to Valdes in the Barcelona goal. Despite being closed down by Di Maria, Valdes sought another touch on the ball before attempting to dribble beyond Di Maria. The end product was the concession of another goal and the tie, which should have been over, is left hanging in the balance. Valdes will make more mistakes in the future but don’t expect any change in the way he plays. It’s necessary for Barcelona to possess a goalkeeper who is comfortable with the ball at his feet and to continue making passes.